Expression of human SSTR2 by lentivirus vector in T cells. (A) A schematic of the lentivirus vector encoding human SSTR2 is shown. LTR, long terminal repeat; SD, splice donor; SA, splice acceptor; EF1α, elongation factor 1α promoter; ψ+, encapsidation signal. Histograms show the level of SSTR2-specific antibody binding to wild-type Jurkat T cells (0%, top) and Jurkat T cells transduced with increasing virus titers. Percentages of SSTR2-positive cells are indicated. (B) Level of SSTR2-specific antibody binding to SSTR2-transduced Jurkat T cells with and without preincubation with 1 μM octreotide (37°C, 30 minutes). The numbers denote mean fluorescence intensity. 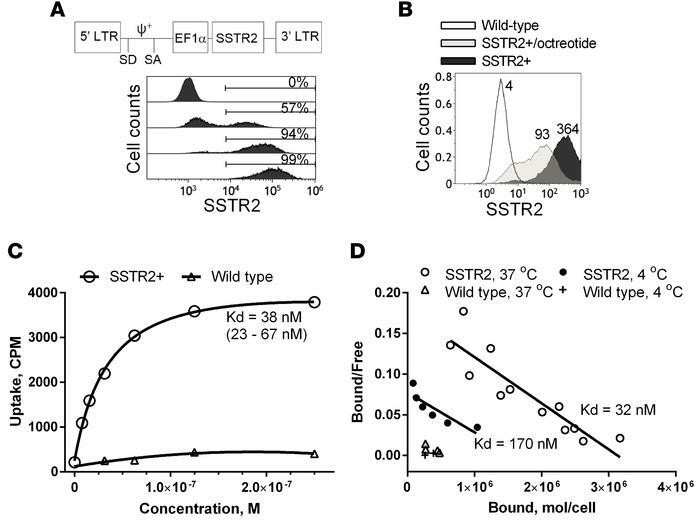 (C) DOTATOC uptake by SSTR2-transduced and wild-type Jurkat T cells versus input DOTATOC concentration is shown. A first-order Langmuir isotherm equation was used to fit the data and to find the equilibrium dissociation constant (Kd). Confidence interval of Kd is shown in parentheses. (D) DOTATOC uptake at 37°C and 4°C by SSTR2-transduced and wild-type Jurkat T cells is shown via Scatchard plot. Predicted Kd is shown. Data shown are from 3 independent experiments. CPM, counts per minute.